While the Average Sale price for the month was up by $312,875 over March 2016 (37.69%), it was actually down from the Average Sale price in February 2017 by $36,895, which was $1,179,798. I’m not convinced this means prices peaked in February, but when you factor in the number of new listings coming online, there is a possibility of new inventory relieving the upward pressure on prices. March is usually the beginning of the selling season, which makes sense why the number of sales was up by 45 total number of sales fin March 2016, and it actually translated to a Sales/New Listing ratio of 60.71%, which indicated it’s still a Sellers Market. March 2016 had 142 sales and March 2015 had 123 sales, so 187 seems to be in line with the current market forces. The worrisome figure for me is the # of new listings of 308. 2016’s busiest month for new listings was June with 224, so to be well above this figure in March may indicate a flood of listings coming to the market soon, which may water down the offerings and cause some downward pressure on prices as home owners try to ‘cash in’ on the record high prices we are experiencing. 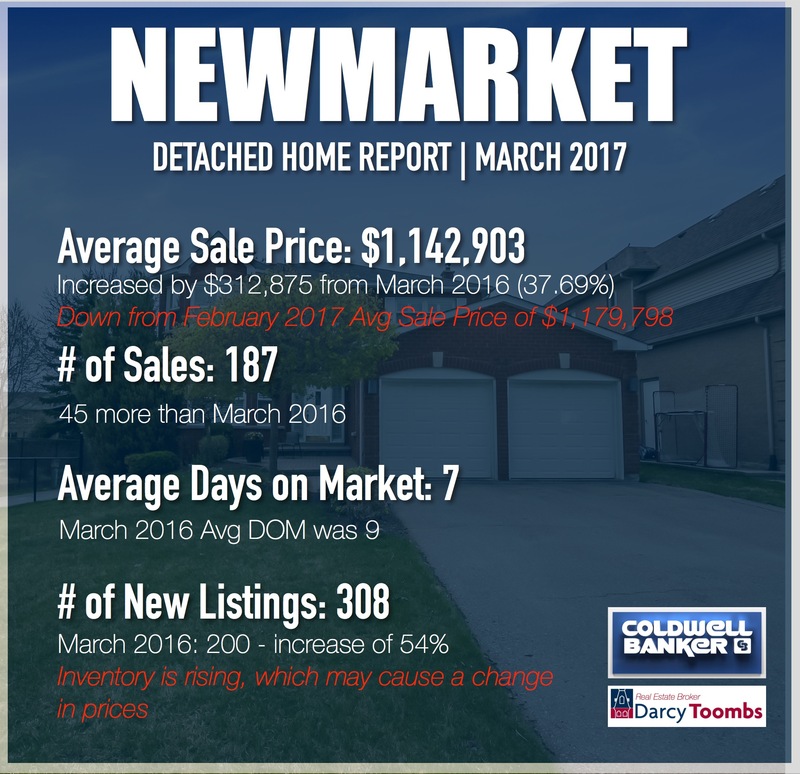 This community saw prices increase by 66.55% over March 2016. now, it should be noted that this community in the Toronto Real Estate Board (TREB) includes both ‘Old Newmarket’ as well as ‘Quaker Hill’ neighbourhoods. Both areas have very different housing types, but share the central geographic location of being in the middle of Newmarket and are both quite desirable. 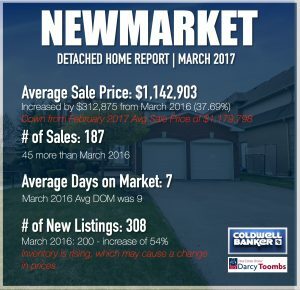 the average sale price in this TREB community was $1,008,615 and had an impressive 32 sales, which was the highest number of sales of all TREB communities too in Newmarket. It should come as no surprise that this is the most expensive section of Newmarket. it’s always been that way. 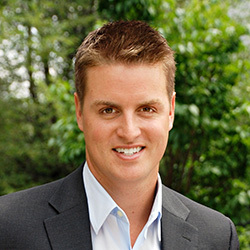 The Median sale price of this community was $1,481,250. Pretty hard to believe that the Median sale price of this community has jumped from $913,500 in March 2015 to where it is today! But big homes near the highway are in demand and sell. When it comes to detached homes, this is the most affordable community in Newmarket right now. With a median sale price of $930,000 (which was down from $1,004,000 in February 2017), this community may be the one for those looking for an affordable detached home. I expect this number to fluctuate a bit as there is a wide variety of housing options in this community. All in all, this market is hard to read. 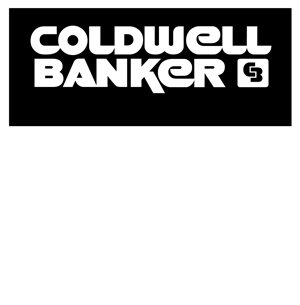 Since the March break ended we have seen some odd things happening in the market place with some homes not getting the action that was expected and others still getting many offers. I think it’s safe to say we are still in a time of uncertainty with which direction things are going, but one thing sure remains to be true, the demand for Newmarket is as strong as it’s ever been, which may have a lot to do with the repeated accolades from many different magazine and internet rankings that consistently put Newmarket near the top of what ever they are rating for quality of life of Canadians. While I do not forecast a drastic drop in prices I do strongly feel that the increased supply of homes to the market may cause a levelling out or even minor correction of values that may have spiked a little pre-maturely ahead of a trend line.